Tourists headed for the observation deck of the world's tallest tower were left disappointed and confused Monday after the owner of Dubai's Burj Khalifa unexpectedly cut off public access to the building because of electrical problems. A lack of information from the building's owner made it unclear whether the rest of the largely empty building, including the dozens of elevators meant to whisk visitors to the tower's more than 160 floors, was affected by the shutdown that began Sunday. The sudden and indefinite closure comes as Dubai struggles to revive its image amid nagging questions about its financial state. 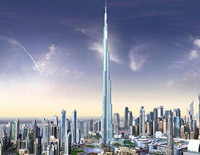 The Gulf Arab city-state had hoped the 2,717-foot (828-meter) Burj Khalifa would be a major tourist draw. Dubai has promoted itself worldwide by wowing visitors with over-the-top attractions such as the Burj, which juts like a silvery needle out of the desert and can be seen from miles around. In recent weeks, thousands of tourists have lined up for the chance to buy advance tickets for viewing times often days later that cost more than $27 apiece. Now many of those would-be visitors must get back in line for refunds. The precise cause of the $1.5 billion Dubai skyscraper's closure remained unclear. In a brief statement responding to questions, building owner Emaar Properties blamed the closure on "unexpected high traffic," but then suggested that electrical problems were also at fault. "Technical issues with the power supply are being worked on by the main and subcontractors and the public will be informed upon completion," the company said, adding that it is "committed to the highest quality standards at Burj Khalifa." The shutdown comes at a sensitive time for Dubai. The city-state is facing a slump in tourism - which accounts for nearly a fifth of the local economy - while fending off negative publicity caused by more than $80 billion in debt it is struggling to repay. Dubai opened the tower on January 4 in a blaze of fireworks televised around the world. The building had been known as the Burj Dubai during more than half a decade of construction, but the name was suddenly changed on opening night to honour the ruler of neighbouring Abu Dhabi. Dubai and Abu Dhabi are two of seven small sheikdoms that comprise the United Arab Emirates. Abu Dhabi hosts the federation's capital and holds most of the country's vast oil reserves. It has provided Dubai with $20 billion in emergency cash to help cover its debts.